This quick-to-make dough makes it possible to prepare these tasty buns, from start to finish, in just 40 minutes. Freeze half to have on hand for another day. Beat egg and milk with fork until well blended. Mix 2-1/4 cups flour, 1 Tbsp. sugar and baking powder in large bowl. Grate 1/2 cup butter into flour mixture; stir with fork until well blended. Add egg mixture; stir to make soft dough. Sprinkle remaining flour onto work surface. Add dough; knead until mixture forms smooth ball. Use rolling pin to roll dough into 12x10-inch rectangle. Melt remaining butter; brush 1 Tbsp. onto dough. Mix remaining sugar and cinnamon. Reserve 1 Tbsp. ; sprinkle remaining over dough. Top with chocolate; press gently into dough. Roll up dough tightly, starting at one long side. Spray 12 muffin cups with cooking spray; coat lightly with flour. Cut dough into 12 slices; place 1 slice in each prepared muffin cup. Brush with remaining butter; sprinkle with remaining cinnamon sugar. Bake 15 min. or until puffed and lightly browned. Transfer to wire rack; cool. Cool buns completely. Freeze any leftovers. To reheat, just pop 2 into the microwave and microwave on HIGH 30 to 40 sec. or just until warmed. You'll know it's a special occasion when the aroma from this special treat fills the house. 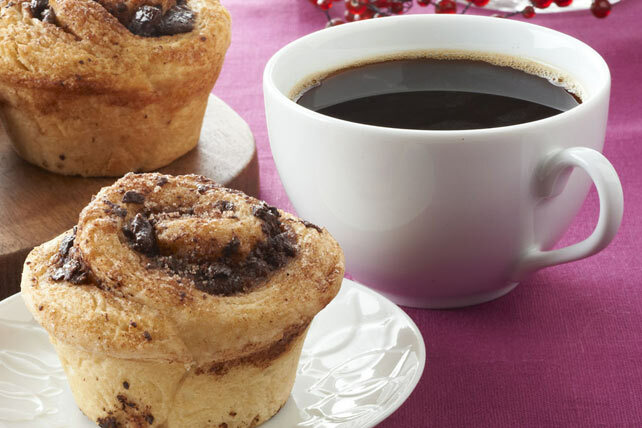 We listened to your feedback and made a few changes to these easy-to-make cinnamon buns, which are a delicious twist on the sticky cinnamon buns that you can buy at your grocery store. In addition to increasing the flour to make the dough easier to handle, we also increased the cinnamon to make the flavour of these buns even more enjoyable.